Messi's penalty made it 2-1 after Manchester City loanee Mangala was sent off for dragging back Suarez, but Munir El Haddadi swept Valencia level. In the end, they should have won by more goals than they did - but they were all over the place defensively for the first hour. 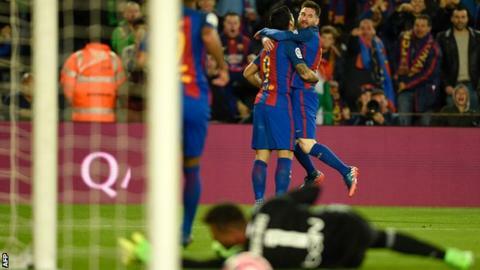 Luis Enrique's three-man back line was caught out too often, with Munir denied by keeper Marc-Andre ter Stegen when clean through seconds before Mangala scored from the resulting corner. Enrique, though, had plenty of reason to fume when his own defenders allowed Munir, on loan from Barcelona, all the time he wanted to turn in Jose Luis Gaya's pull-back. That settled the home side, who could have had plenty more goals - with Neymar going closest as he hit the post with a free-kick. In the end, they settled for two in the second half; Messi - La Liga's leading scorer - caught out keeper Diego Alves with a near-post drive and substitute Gomes tapped in from Neymar's pass. Match ends, Barcelona 4, Valencia 2. Second Half ends, Barcelona 4, Valencia 2. Martín Montoya (Valencia) is shown the yellow card for a bad foul. Goal! Barcelona 4, Valencia 2. André Gomes (Barcelona) right footed shot from very close range to the top right corner. Assisted by Neymar. Attempt missed. Neymar (Barcelona) right footed shot from the centre of the box is close, but misses the top right corner. Assisted by Sergi Roberto. Substitution, Valencia. Zakaria Bakkali replaces João Cancelo. Offside, Barcelona. Javier Mascherano tries a through ball, but Luis Suárez is caught offside. Attempt saved. Neymar (Barcelona) right footed shot from the left side of the box is saved in the centre of the goal. Assisted by Lionel Messi. Attempt blocked. Sergi Roberto (Barcelona) right footed shot from the centre of the box is blocked. Assisted by André Gomes. Attempt missed. Daniel Parejo (Valencia) right footed shot from outside the box misses to the right from a direct free kick. André Gomes (Barcelona) is shown the yellow card for a bad foul. Neymar (Barcelona) hits the left post with a right footed shot from outside the box from a direct free kick. Substitution, Barcelona. André Gomes replaces Rafinha. Attempt missed. Neymar (Barcelona) right footed shot from the left side of the box is too high. Assisted by Andrés Iniesta. Substitution, Valencia. Simone Zaza replaces Munir El Haddadi. Attempt missed. Luis Suárez (Barcelona) right footed shot from the centre of the box misses to the right. Attempt saved. Lionel Messi (Barcelona) left footed shot from the left side of the box is saved in the centre of the goal. Assisted by Neymar. Attempt saved. Sergi Roberto (Barcelona) header from the centre of the box is saved in the centre of the goal. Assisted by Neymar with a cross. Offside, Valencia. Ezequiel Garay tries a through ball, but Daniel Parejo is caught offside. Attempt missed. Luis Suárez (Barcelona) right footed shot from outside the box is close, but misses the top right corner. Assisted by Lionel Messi. Andrés Iniesta (Barcelona) is shown the yellow card for a bad foul. Attempt saved. Rafinha (Barcelona) right footed shot from outside the box is saved in the centre of the goal. Assisted by Lionel Messi.